As part of a collaboration between Oxford and the Sorbonne, we are delighted to announce the new call for applications for a three-year fully funded fellowship open to students wishing to pursue doctoral studies in the history of science, in mathematical sciences, in digital humanities, or in computer science. Details of the fellowship are set out below, both in English and in French. Recent progress in digital humanities has transformed research in the history of science: large quantities of data, the collation of which would formerly have required time-consuming visits to libraries and archives, have been made available; manuscript and book collections are accessible online; and investigations across a range of related resources become ever easier. In consequence, historical investigations can be contextualized better, studies of networks taken to a new level, and analysis conducted across increasingly large quantities of data and metadata. Applications are open currently for a fellowship that will offer the successful doctoral student the opportunity to undertake research over a period of three years at two of the most prestigious institutions in Europe: Sorbonne University in Paris and the University of Oxford. Applicants should have a background in one or more of the following four disciplines: digital humanities, history of science, mathematics, or computer science. They should demonstrate experience of historical study alongside evident ability in the field of digital humanities or data sciences. Thesis topics might combine any area of the history of science with an approach in digital humanities. In particular, proposals exploring innovative digital or computer-based approaches for research in the history of mathematical sciences or on early modern correspondence will be welcome, as will those involving investigation into how the development of digital analysis, research, and visualization tools can contribute to new research on scientific and/or epistolary corpuses. This programme forms part of a scientific collaboration between the Sorbonne’s Faculty of Science and Engineering and the Faculty of History at the University of Oxford. The successful doctoral student will work within the ‘Digital Humanities’ team at the Institut des sciences du calcul et des données (ISCD) of Sorbonne University (Paris, France) and will conduct a period of research at the University of Oxford (UK), either within the framework of the Cultures of Knowledge research project/Early Modern Letters Online [EMLO] at the Faculty of History, or of the Centre for the History of Science, Medicine, and Technology, or of the Mathematical Institute. The student will benefit from a three-year funding grant from the Faculty of Science and Engineering of Sorbonne University. Further information regarding this opportunity is available from Alexandre Guilbaud (alexandre.guilbaud@sorbonne-universite.fr) or Miranda Lewis (miranda.lewis@history.ox.ac.uk). To apply, please send a copy of your CV and an outline of your planned research project to Alexandre Guilbaud (alexandre.guilbaud@sorbonne-universite.fr) before the closing date of 14 June 2019. Les progrès récents accomplis dans les humanités numériques ont transformé la recherche dans le domaine de l’histoire des sciences : des quantités importantes de données, dont le rassemblement aurait autrefois demandé de nombreuses et longues visites de bibliothèques et d’archives, ont été mises à disposition, des collections de manuscrits et de livres sont accessibles en ligne, et les recherches à travers un éventail de ressources connexes n’ont jamais été aussi faciles. En conséquence, les recherches historiques peuvent être mieux contextualisées, des études de réseaux amenées à un autre niveau, l’analyse peut être réalisée à travers des quantités de plus en plus grandes de données et de métadonnées. Les candidatures sont ouvertes pour une allocation de recherche qui offrira au doctorant retenu l’opportunité d’entreprendre des recherches sur une période de trois ans au sein de deux des institutions les plus prestigieuses d’Europe : Sorbonne Université à Paris et l’Université d’Oxford. Les candidats devront avoir une formation dans une ou plus des quatre disciplines suivantes : les humanités numériques, l’histoire des sciences, les mathématiques ou l’informatique. Ils devront démontrer qu’ils possèdent une expérience des études historiques ainsi que des compétences manifestes dans le domaine des humanités numériques ou des sciences des données. Les sujets pourront associer n’importe quel domaine de l’histoire des sciences avec une approche en humanités numériques. En particulier, les propositions explorant des approches numériques ou informatiques innovantes pour des recherches en histoire des sciences mathématiques ou des recherches sur les correspondances de l’ère moderne seront bienvenues, de même que les problématiques s’intéressant à la façon dont le développement d’outils d’analyse, de recherche de visualisation numériques peut contribuer à de nouvelles recherches sur les corpus scientifiques et/ou épistolaires. Ce programme s’inscrit dans le cadre d’une collaboration scientifique entre la Faculté des Sciences et Ingénierie de l’Université de la Sorbonne et la Faculté d’Histoire de l’Université d’Oxford. Le candidat sélectionné travaillera au sein de l’équipe ‘Humanités numériques’ à l’Institut des sciences du calcul et des données (ISCD) de Sorbonne Université (Paris, France) et effectuera une période de recherche à l’Université d’Oxford (Royaume-Uni), soit dans le cadre du projet Cultures of Knowledge/Early Modern Letters Online [EMLO] à la Faculté d’Histoire, ou du Centre for the History of Science, Medicine, and Technology, ou de l’Institut de Mathématiques. Le doctorant bénéficiera d’une allocation doctorale de trois ans financée par la Faculté des Sciences et Ingénierie de Sorbonne Université. De plus amples renseignements concernant cette opportunité sont disponibles auprès d’Alexandre Guilbaud (alexandre.guilbaud@sorbonne-universite.fr) ou de Miranda Lewis (miranda.lewis@history.ox.ac.uk). Pour poser votre candidature, veuillez envoyer une copie de votre CV et un résumé du projet de recherche envisagé à Alexandre Guilbaud (alexandre.guilbaud@sorbonne-universite.fr) avant la date du 14 Juin 2019. This entry was posted in Uncategorized on April 15, 2019 by Miranda Lewis. This is not an early April fool but rather a gentle (and genuine!) 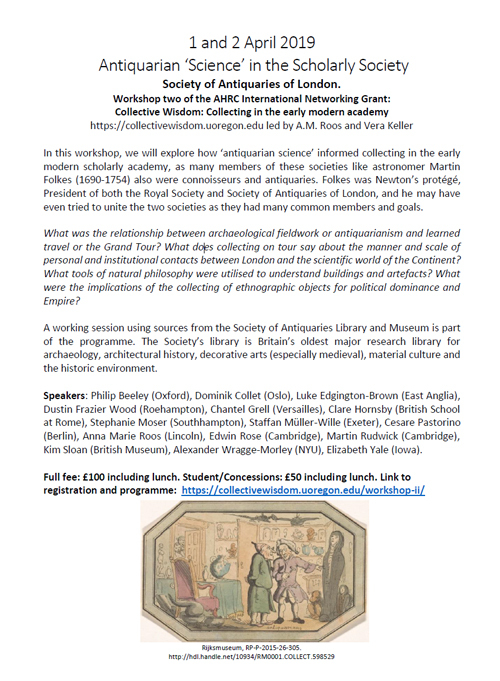 reminder for those who are interested in joining ‘Networking Archives‘, the AHRC-funded project with which Cultures of Knowledge is involved at present: submissions of applications to attend a series of training schools and a colloquium, together with the chance to author a chapter in an edited volume, will close this coming Monday, 1 April. Details of the opportunity may be found in an earlier post on this blog, as well as on the Networking Archives website. This entry was posted in Uncategorized on March 30, 2019 by Miranda Lewis. 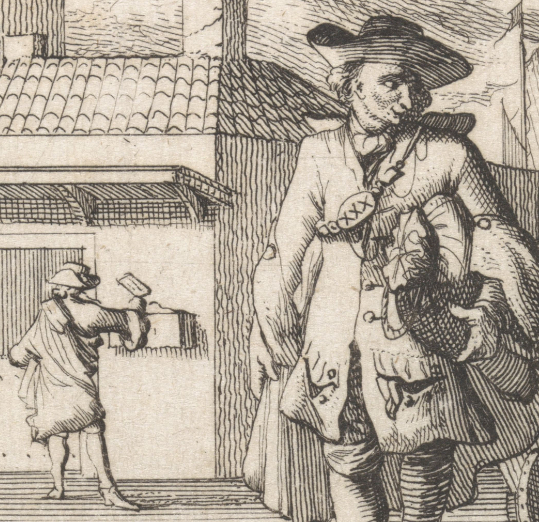 With work at Early Modern Letters Online continuing apace and a number of different strands and projects being juggled simultaneously, it is always encouraging to announce exciting new opportunities and promote collaboration. One such opportunity involves Cultures of Knowledge‘s Arts and Humanities Research Council [AHRC] funded research project Networking Archives. As explained in an earlier post on this site entitled ‘Announcing “Networking Archives: Assembling and analysing a meta-archive of correspondence, 1509–1714″‘, Networking Archives is a collaboration between Cultures of Knowledge, Dr Ruth Ahnert (Queen Mary University of London), and Dr Sebastian Ahnert (University of Cambridge), with Gale State Papers Online. At present, preparatory work is underway to prepare and interrogate the metadata collated from the correspondence to be found within the Tudor and Stuart State Papers — both domestic and foreign — alongside the data contained in Early Modern Letters Online. This combination of datasets, together with use of the project’s accompanying tools and infrastructure, will enable researchers to query and analyse their own epistolary metadata and to pose new kinds of questions on the history of the different forms of ‘intelligencing’ between the sixteenth and the nineteenth centuries. One of the ambitions of Networking Archives is to bring together and to foster a community of scholars, data analysts, and developers who share an interest in correspondences that overlap and intersect with the datasets under investigation. Applications are being accepted currently for participation in a scheme that involves a series of training schools and a colloquium. These events, scheduled to take place in Cambridge and Oxford over the course of the next two years, are intended to provide hands-on training in data collation and curation, in network analysis, and in basic coding. Successful applicants will be offered the opportunity to develop their research into chapters that will be published in an edited collection. Further details of these events, and the conditions regarding application, may be found on the Networking Archives project news page. This entry was posted in Uncategorized on February 28, 2019 by Miranda Lewis. On a day in which Mary-Ann Constantine from the Centre for Advanced Welsh and Celtic Studies [CAWCS] at the University of Wales gave an inspirational paper on travel writing and the letters exchanged between the antiquarian Richard Gough and the naturalist and writer Thomas Pennant (introducing the former with the show-stopping phrase ‘Gough tends to be known most widely as a shelfmark’), it is a tremendous pleasure to be circulating news of a forthcoming workshop that will explore how ‘antiquarian science informed collecting’ and collections in the’ early modern scholarly academy’. Organized by the historians of science Anna Marie Roos and Vera Keller, this event will take place on 1 and 2 April at the Society of Antiquaries of London and will examine the work of many of the early modern figures who crossed the divide between natural philosophy and antiquarianism. Full details of the programme and speakers, together with information regarding registration for the workshop, may be found here. This entry was posted in Uncategorized on February 11, 2019 by Miranda Lewis. In November 2017, a delegation of scholars from Oxford, including the Chichele professor of medieval history Julia Smith, the Cultures of Knowledge project director and professor of early modern intellectual history Howard Hotson, and the professor of modern history Robert Gildea, visited the University of Padua to discuss potential collaboration between the two institutions. One outcome of this visit was the establishment of a framework to enable student exchange, and duly an undergraduate from the Galileian School and the University of Padua was selected to visit Oxford in Trinity term 2018. With the support and encouragement of Professor Paola Molino at the University of Padua, this first student, Francesco Zambonin, elected to spend his month in Oxford learning about epistolary metadata with Early Modern Letters Online. In addition to acquiring valuable experience in the necessary preparation of metadata prior to upload into an epistolary union catalogue, Francesco chose to compile an inventory of correspondence for one of the most fascinating Italian female scholars in the early modern period. We are delighted to be publishing in EMLO this week the fruits of his work with the release of the catalogue of the letters of Elena Lucrezia Cornaro Piscopia. Cornaro Piscopia (1646–1684) was born illegitimate, the third child of a Venetian patrician (and subsequent procurator of St Mark’s) Giovanni Battista Cornaro and his then mistress Zanetta Boni; although the couple married in 1654, only their sons were legitimized. Cornaro Piscopia’s gift for languages (which earned her the title ‘Oraculum Septilingue‘), music, and mathematics, in addition to her erudition in theology and philosophy, were encouraged from an early age and permitted to flourish.1 This female scholar chose not to marry — rather, she entered the Benedictine order as an oblate — and her scholarship became renowned across Europe. At the age of just nineteen, she was referenced in the dedication to her father by the Swiss theologian Johann Heinrich Hottinger in the sixth volume of his Historia Ecclesiastica, and she is recorded as having been elected as member to seven academies in five different Italian cities between 1669 and 1672.2 In 1678, Cornaro Piscopia was awarded her doctorate in philosophy at the University of Padua and in the process — as far as has been established to date — she may have become the first woman to attain this degree. Certainly, the process attracted widespread attention: her viva was conducted in front of crowds too numerous to be accommodated in the university hall and thus the ceremony was moved to the Basilica of Saint Anthony of Padua, where Cornaro Piscopia chose to discourse on Aristotle, whose work she had studied under the guidance of the philosopher Carlo Rinaldini (1615–1698). Upon her death from some form of wasting illness in 1684 , Cornaro Piscopia was buried in Santa Giustina, Padua. The following year a medal was struck by the university in her honour and in 1688 a collection of her writings was published.3 This same year, in a letter to his friend Samuel Pepys, John Evelyn wrote of: ‘Helen Cornaro, daughter of a procurator of St. Marco (one of the most illustrious families of Venice), who received the degree of Doctoress at Padua for her universal knowledge and erudition, upon the importunity of that famous University prevailing on her modesty. She had been often sought in honourable marriage by many great persons, but, preferring the Muses before all other considerations, she preserved herself a virgin, and being not long since deceased, had her obsequies celebrated at Rome by a solemn procession, and elogy of all the witness of that renowned city.’4 Notwithstanding Corrnaro Piscopia’s wish to be interred simply and not in a tomb more fitting with the status of her father’s family, the scholar’s remains were disinterred in 1895 by the English Benedictine Abbess Mathilda Pynsent and placed in a new casket, and a new tablet was erected to her memory. 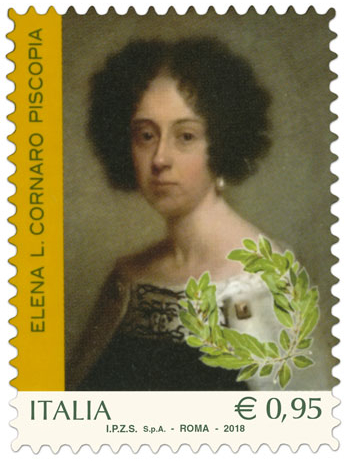 It seems fitting today that the pioneering student to visit Oxford from Padua within the parameters of a new exchange scheme should honour the memory of Elena Lucrezia Cornaro Piscopia in EMLO with the beginnings of an inventory of her surviving correspondence. This entry was posted in Uncategorized on January 31, 2019 by Miranda Lewis. Although Van Helmont’s letters seem to have been lost and only this minute number from what was perhaps an extensive body of work appears to survive in the correspondence archives of others, this does not prevent scholars today from enriching further the records of what is logged already in EMLO. 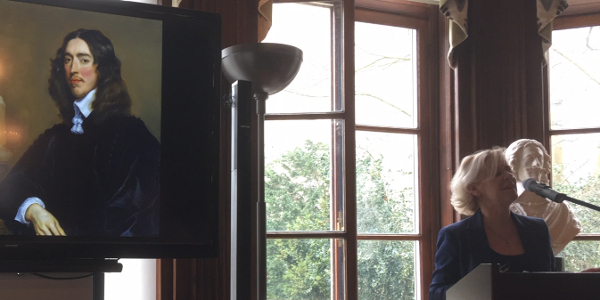 We are delighted that Dr Georgiana Hedesan has offered to provide abstracts for Van Helmont’s known letters and to tag the people mentioned and the topics discussed therein, as well as to consider the influence and afterlife of the influential Paracelsian through the lens of the correspondences of others in the period. In the meantime, we’d like to take this opportunity to wish all users of Early Modern Letters Online a happy new year. We look forward greatly to hearing from and, we hope, working with many of you in 2019. This entry was posted in Uncategorized on December 31, 2018 by Miranda Lewis. Back in the spring of this year the COST-funded Reassembling the Republic of Letters action organized its third and final training school, EMLO ‘on the road’. 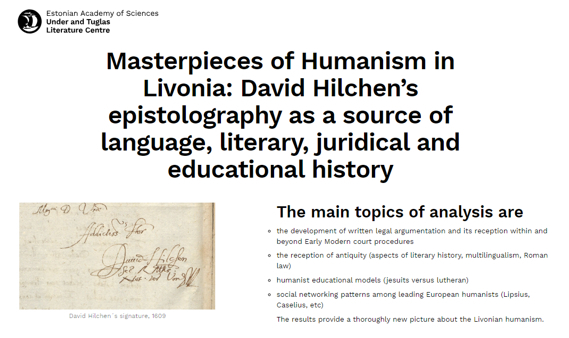 At the suggestion and invitation of Dr Kristi Viiding, who is working on the Livornian humanist and lawyer David Hilchen [Heliconius] (1561–1610), this two-and-a-half-day event was hosted by the Under and Tuglas Literature Centre of the Estonian Academy of Sciences, Tallinn, and was dedicated to the preparation of epistolary metadata for inclusion in a union catalogue of early modern correspondence. This inventory is being published in EMLO in two installments. The first consists of the basic metadata for ninety-eight surviving letters sent by and to Hilchen prior to his departure from Livonia at the end of January 1603. 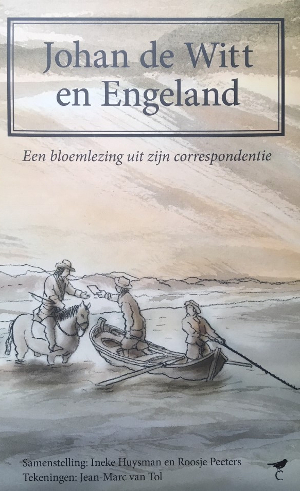 The second installment will contain the letters written during the humanist’s exile in Poland between March 1603 and May 1610 (the month preceding his death), and these will be added to EMLO in the autumn of 2019. For the present, we trust EMLO’s users enjoy exploring the catalogue, and we look forward greatly to continuing our work with Dr Vidiing and her team in the course of the forthcoming year. This entry was posted in Uncategorized on December 24, 2018 by Miranda Lewis. Amidst the bustle of this autumn’s activities, it is a tremendous pleasure to be announcing the publication in Early Modern Letters Online of a new correspondence catalogue — that of Antonio Agustín (1517–1586) — in celebration of the partnership between Cultures of Knowledge and the Spanish Republic of Letters [SRL] project, an inspiring initiative that is gathering momentum on the far side of the Atlantic. SRL is in the process of collecting data to examine the networks of Spanish humanists and, by charting the intellectual correspondence exchanged ‘in the different centers of learning of the Iberian Peninsula (cities, universities, the court) and the rest of Europe’, is set to challenge the misconception that Renaissance Spain played a marginal role in the intellectual exchanges of the period. Headed by Dr Guy Lazure and hosted at the University of Windsor, Ontario, Canada, SRL has created a database to house the metadata of both the correspondence and private library collections of major Spanish humanists. Based on metadata supplied by SRL, the inventory of letters of Antonio Agustín marks the third in a series of catalogues in EMLO of sixteenth-century humanist correspondence from the Iberian peninsula — following those of Juan Luis Vives (1493–1540) and Hernán Núñez de Toledo y Guzmán (1475–1553) [El Pinciano]. Agustín was a canon law historian, a numismatist, a collector of archaeological artifacts, and a bibliophile, and in the course of his life he amassed an impressive library, a partial inventory of which was published following his death in Tarragona on 31 May 1586. Thanks to an exchange of data between the two projects, metadata for the letters from Agustín’s correspondence are available now for consultation within the EMLO union catalogue and users will find links have been provided within each letter record to the SRL database. Data dispatched from EMLO to Dr Lazure for the correspondence of Vives is to be followed by additional inventories that are in the process of being collated in Oxford. For the present, we hope users of EMLO will benefit from this partnership by following the links provided in the Agustín catalogue to explore more broadly the range and scope of the Spanish Republic of Letters database. This entry was posted in Uncategorized on November 23, 2018 by Miranda Lewis. Having married Edward, third Viscount Conway and Killultagh (c. 1623–1683), who encouraged her wholeheartedly in her intellectual pursuits, Lady Anne had access to the family’s collection of books that formed one of the largest private early modern libraries in the country. A victim of severe ill health, she was forced to live in semi-retirement at the Conway family seat, Ragley Hall in Warwickshire but her illness introduced her, as a patient, to some of the renowned physicians of her age, including William Harvey, Theodore Turquet de Mayerne, and Thomas Willis, as well as to the ‘Irish stroker’, Valentine Greatrakes. In the final years of Lady Anne’s life, Francis Mercury Van Helmont (1614–1699), the son of the Flemish natural philosopher Jan Baptist van Helmont (1580–1644), joined her household at Ragley. As well as encouraging her to study the Jewish Kabbalah, Van Helmont introduced Lady Anne to Quakerism and she received visits from the Quaker leaders George Fox, Robert Barclay, George Keith, and William Penn whilst using her influential contacts to help their imprisoned followers. 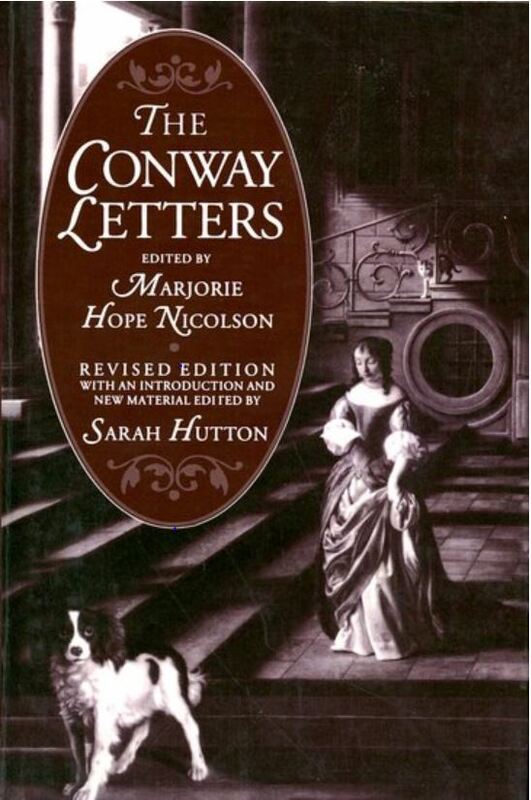 Shortly before her death, Anne Conway converted to Quakerism, despite opposition both from her family and from Henry More. And those who relish an unorthodox twist to their fairy tales might be intrigued to know that when she died on 23 February 1679, Van Helmont preserved her body in a glass coffin. 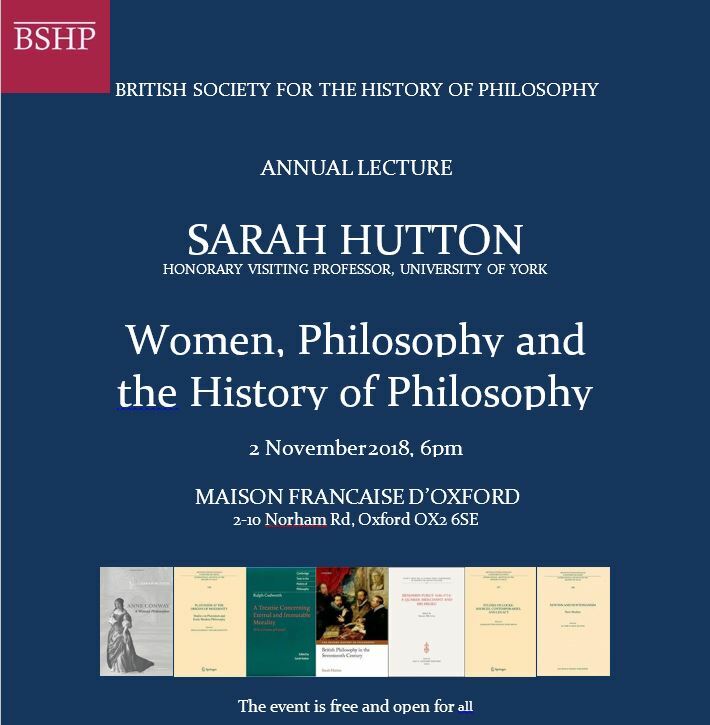 To discover more about this fascinating early modern woman, please do explore the correspondence catalogue, procure copies of Sarah Hutton’s publications, and — should you be in town — head to the Maison Française in Oxford for 6 p.m. on Friday, 2 November! This entry was posted in Uncategorized on November 2, 2018 by Miranda Lewis.